That stammer. Those basset-hound eyes. That bone-dry wit. There has never been another comedian like Bob Newhart. His comedy albums, movies, and two hit television series have made him a national treasure and placed him firmly in the pantheon of comedy legends. Who else has a drinking game named after him And now, at last, Newhart puts his brilliant and hysterical world view on paper. Never a punch-line comic, always more of a storyteller, he tells anecdotes from throughout his life and career, including his beginnings as an accountant and the groundbreaking success of his comedy albums and The Bob Newhart Show and Newhart, which gave him fifteen years on primetime television. And he also gives his wry, comedic twist to a multitude of topics, including golf, drinking, and family holidays. Today, Newhart appears on Desperate Housewives, in hit movies such as Elf, and in theaters around the country. Reruns of his shows air constantly on Nick at Nite--have recently been released with great success for the first time ever on DVD. 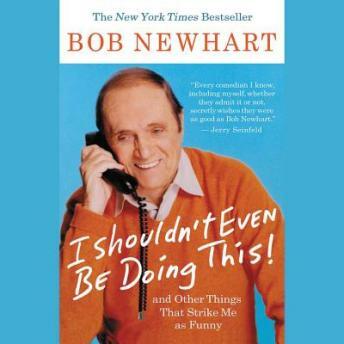 With this book, Bob Newhart gives his millions of fans a first ever opportunity to sample his unique brand of humor--including excerpts from some of his classic routines--on the printed page.